Crazy capers out on patrol as our redoubtable heroes prepare to hold off the Hun! 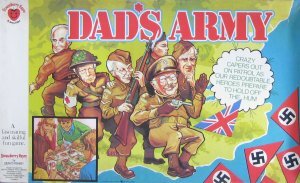 The Dad's Army board game was published by Denys Fisher, under their Strawberry Fayre label, in 1974. Dad's Army is one of my personal favourite board games, mainly because the programme is one of my top TV shows of all time. For the same reason, this game is always popular with collectors. The show itself is a classic, so the board game will probably remain popular forever too. Special Note: I have seen a copy of this game with 32 order cards instead of the 24 detailed above. There were 4 extra red cards, numbered 9,10,11 and 12, plus 4 extra black cards, numbered 9,10,11 and 12. I don't know if this was an accident at the factory or a deliberate addition, but the 24 cards listed above seems to be the 'normal' contents. Price: From £60 plus postage.